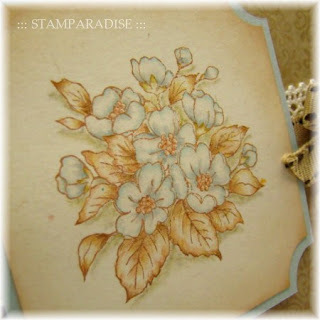 I've entered this card in the Verve Sketch Challenge that is one of the challenge in this week's Stampin' Out Alzheimer's (SOA) event. 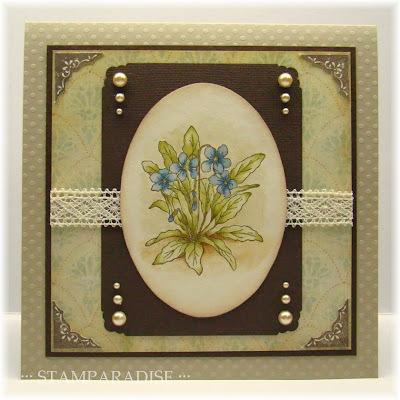 I coloured the image with distress inks and sponged Antique Linen and Vintage Photo inks around the image. 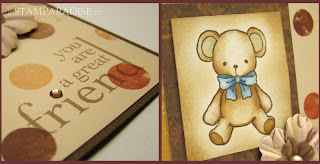 I chose Rich Cocoa ink (Memento) to stamp the sentiment, but it was not good choice as it was too light. 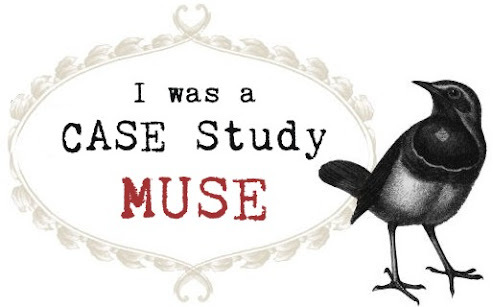 I think I should use opaque ink like Versa Magic. 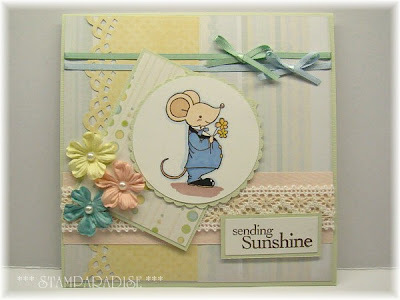 I think this card is qualified for the follwing 2 challenges.The first one is Charisma Cardz Challenge #21 (Going-Dotty!) 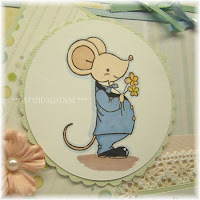 and another one is Cute Card Thursday #62 (Bit o'Bling). Thank you for looking! Have a nice weekend! 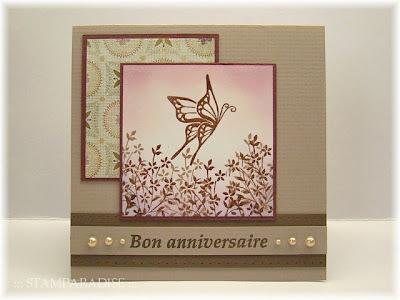 I made this card for Mojo Monday #88.It's also doubling as the challenge in this week's Stampin' Out Alzheimer's (SOA) event.I didn't use any stamp on this card, but I hope it will be acceptable. This weeks Stamp Something require us to make our project using the sketch Emily has designed. So I made this card. 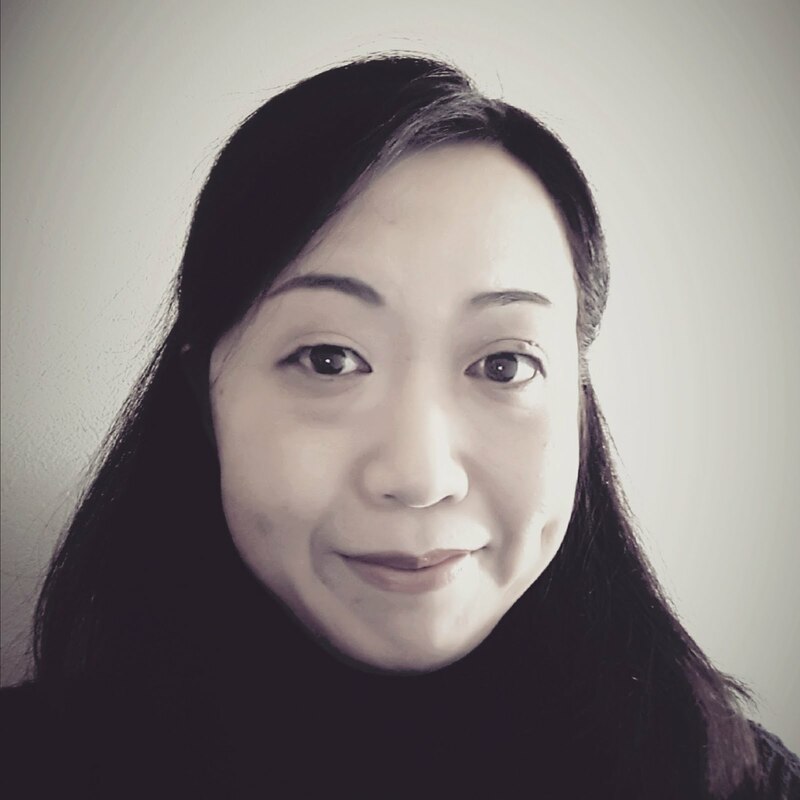 I've received a blog award! 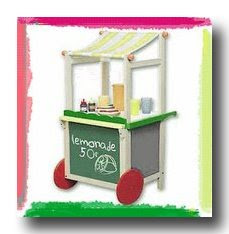 I've received this Lemonade Stand Blog Award from Cheryl.This award is given to a blogger who shows great attitude and gratitude! 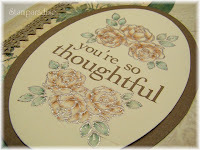 Cheryl is a very talented card maker,and she is always stopping by my blog and leaving heartful comments.Thank you so much for thinking of me,Cheryl! I challenged colouring by distress inks for the first time on this card.It was very difficult for me and I'm not satisfied with the result.But I truly enjoyed it!Hope you like it. I carved a new frolal stamp last night,and made this card using that.I think that this image matches a simple layout and simple papers very well. 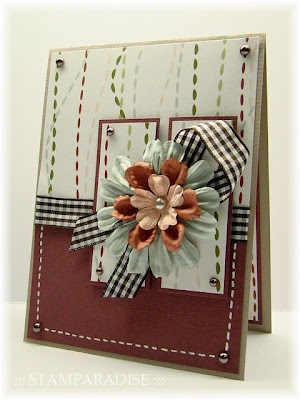 The backing paper was made in the same way with the card I made before again. Thanks for looking. Have a wonderful weekend! 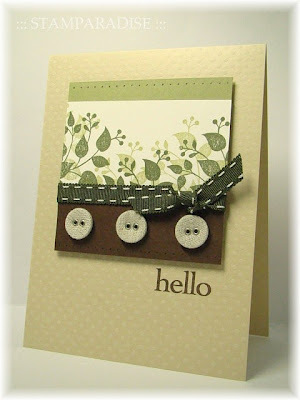 I made this card for Sketch Saturday challenge #51. I know the center circle is too small as compared with the sketch they provided.But I'm very satisfied how it turned out. The small roses I added were sold by 40 percent discount at a local craft shop!I've bought 3 packs(red,pink and yellow) without hesitation!Um...Should I have bought blue one?lol! I made this card for Colour Create #16.Their theme is "Sky blue,Tan and Ecru".Wow!It's so elegant combination,isn't it? 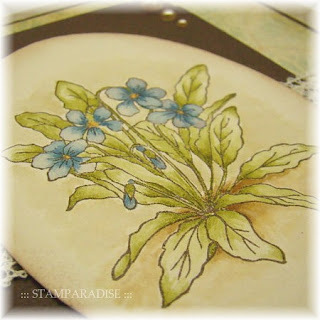 I stamped the floral image with Bark ink and colourd it with Holbein Artist Coloured Pencils and Meltz pen. And then, I sponged　Cafe au lait and Bark ink　around the edge of the main panel. 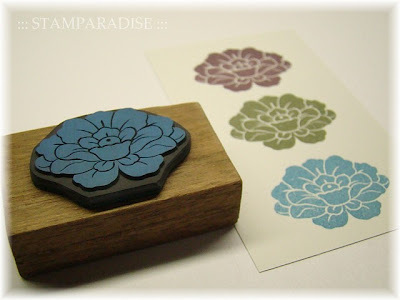 The Backing paper was made by myself.I stamped my background stamp on kraft paper with Versa Mark ink,and sponged Cocoa ink. 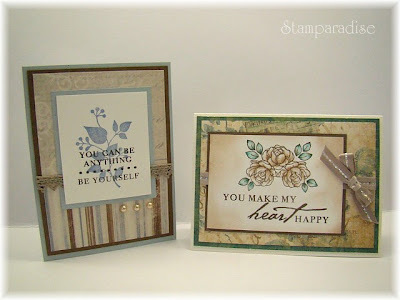 These are my hand-carved stamps were used on today's card. 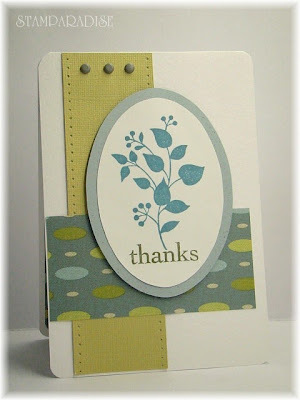 This weeks theme at Stamp Something is "Clean and Simple Thank You Somethings" and they are featuring one of their DT member Lauren.They require us to case her work or create our own card inspired by one of her creations.I browsed Lauren's wonderful blog,and took my inspiration from this card! 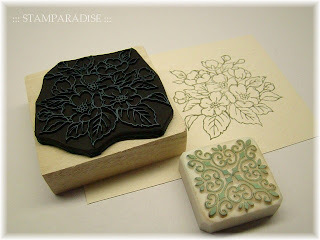 At first,I started with carving a new floral stamp.Here is my new stamp! I made this card for my friend who loves butterfly very much. I stamped the butterfly and floral images by Cafe au lait and Cocoa ink,and heat embossed them with clear embossing powder.And then,I sponged Old rose and Mauve ink.I hope she loves it. 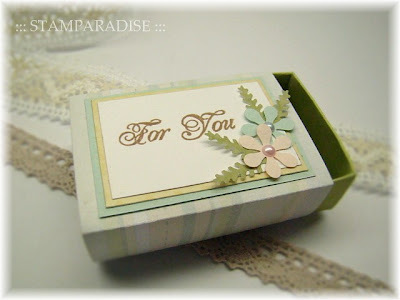 The tiny little gift box. 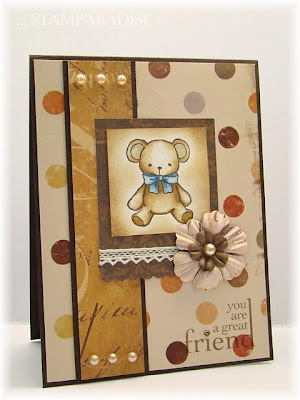 This weeks theme at the ABC Challenge is "N is for Not a Card". The card making gives me a lot of fun,and at the same time,it gives me a lot of scraps of paper!I decided to make some little gift box using these scraps.The size of this box is approximately 4cm×5.8cm×2.0cm.I'll use this box to present an earring or a necklace to my friend. I made these boxes at my daughter's request. (She is 8 years old. 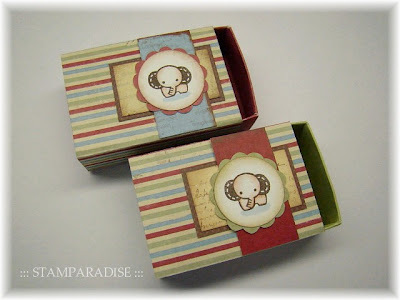 )She said to me that her hair accessories will be put in these box. 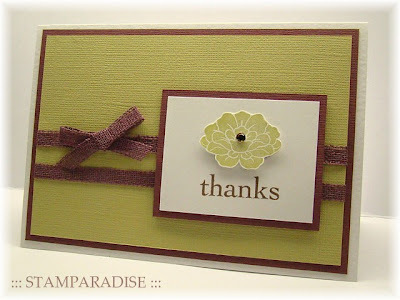 I made this "Thanks card" for Our Creative Corner Challenge using the sketch Robin provided.It is sooooo simple that I have nothing to say about this card. lol! 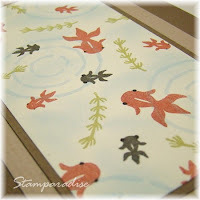 Here is the inside photo.I stamped the same image that I used on the top panel with bamboo ink(Artonic/TSUKINEKO). 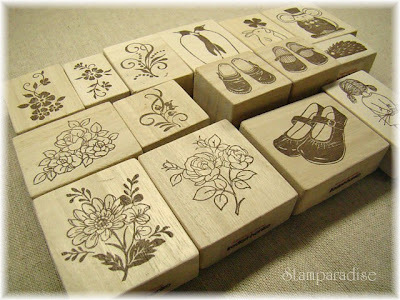 I have been concentrating to make some hand-carved stamps this several days.These are some of the stamps I've completed.They are going to be put on sale at the 2nd anniversary event of "hygge+" which will be held on the end of this month. I made these cards for a tiny little present for customers. I hope they will like it. Thanks for looking!I'll be back with my new card in a few days. 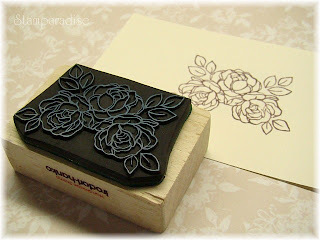 I made a 10.5*20cm card again with this stamp today. 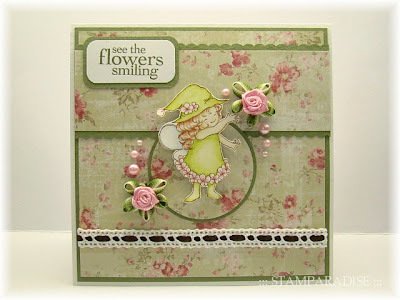 I based this card on the sketch Vee made for this weeks Charisma Cardz Challenge.I stamped the rose image with cocoa ink(VersaCraft/Kuretake),and heat embossed them with pearl embossing powder.And then I coloured them with Holbein Artist Coloured Pencils and Melts Pen. 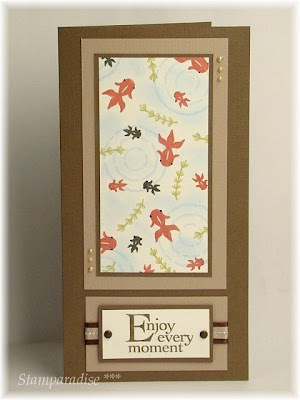 I think this card is qualified for this weeks Creative Card Crew as their theme is "Everyone Emboss". Thanks for looking.Have a wonderful weekend! 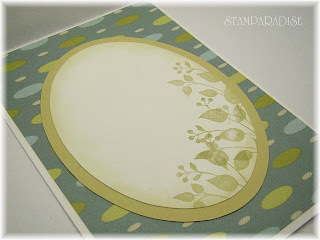 This is a Mother's Day Card as you can see.lol! 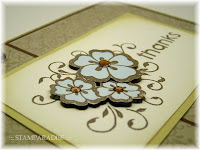 I didn't use any stamps on this card!I wrote the letter,"Mother's Day",with a calligraphy marker.I'm learning a calligraphy for about 1 year.And I learned this letter in today's class.It's good timing! :) I know it isn't perfect but I think it's so so. 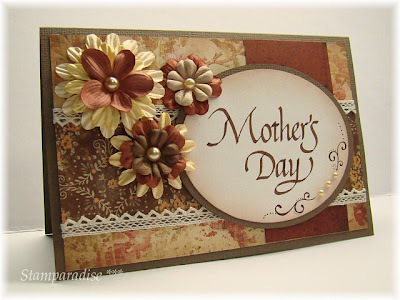 I think this card is qualified for this weeks Our Creative Corner(Mother's Day) and Colour Create #14(Red,Cream and Chocolate). 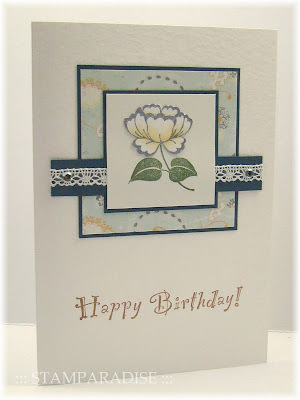 Simple layout,no design papers,just a few embellishments...It's truly simple card.But I love it. 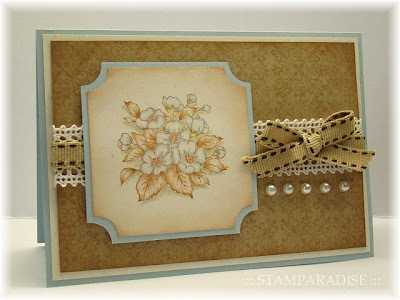 I made this card for the sketch challenge at this weeks Creative Card Crew.Sharon has provided so fabulous sketch.When I saw this sketch,I thought pastel colour would match it well.But Sharon's black and white card using this sketch is so gorgeous!! 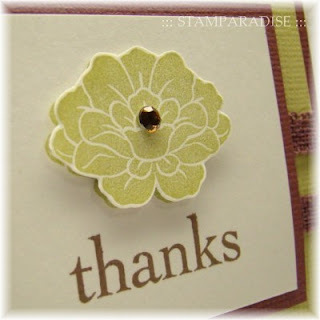 By the way,I have used a ready-made acrylic stamp for the first time in my creations.The sentiment stamp,"sending Sunshine",is that.It is so difficult to carve letters perfectly that I had only a few sentiment stamps.So I couldn't resist to buy some ready-made stamps.I hope they give new variety to my creations. Thanks for looking!Have a nice weekend!